So how many of you have confusion on which is pasala keerai and palak keerai? they both are different and which one is called spinach? any idea? please clarify me. 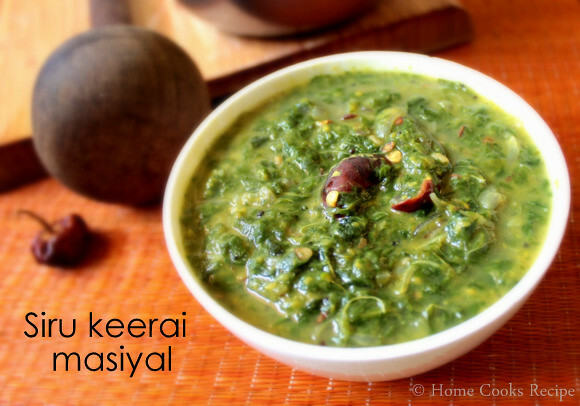 This pasalai keerai kootu is one of the delicious green recipe. definitely this is not a boring green recipe, so give a try. Pressure cook the toor dal in a cup of water with a drop of sesame oil, a pinch of turmeric and a pinch of hing for about 4 or 5 whistles. Clean the pasalai keerai in a stariner under clean water. once washed and drained, chop the leaves and set aside. Heat a pan, add one tsp of oil, add finely chopped onion, and saute well till it turns translucent, next add the crushed garlic, tomatoes and saute them in medium flame till the tomatoes mix well with the onions. add a pinch of turmeric, salt & mix well. Now add the chopped pasalai keerai to the pan and saute the leaves along with the onions and tomatoes till the leaves wrinkle and get cooked. 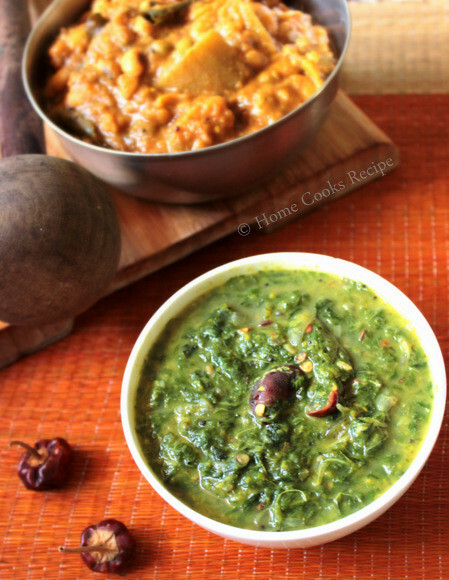 once the leaves are cooked, add the boiled and mashed toor dal and the grounded coconut paste and mix well. add salt to taste and little water as per the consistency you require. let it boil in medium flame for about 2 mins and switch off the flame. In a small tadka pan, heat a tsp of oil, add mustard and let it pop, then add vadagam, cumin and hing. in a very low flame saute them for few seconds and the tempering to the keerai. Serve the keerai kootu with hot rice and with appalam or potato roast. You can use moong dal instead of toor dal. Add more red chilli, if you prefer the kootu spicy. 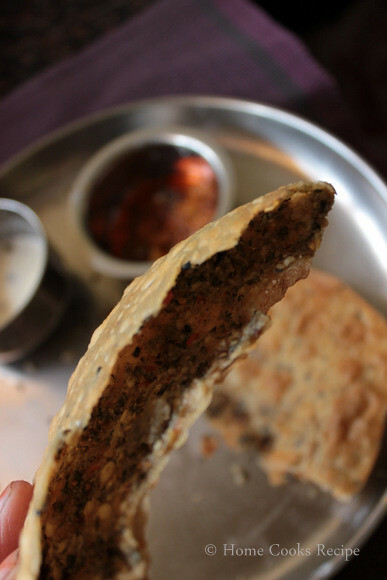 This stuffed puri is a famous north indian break-fast. 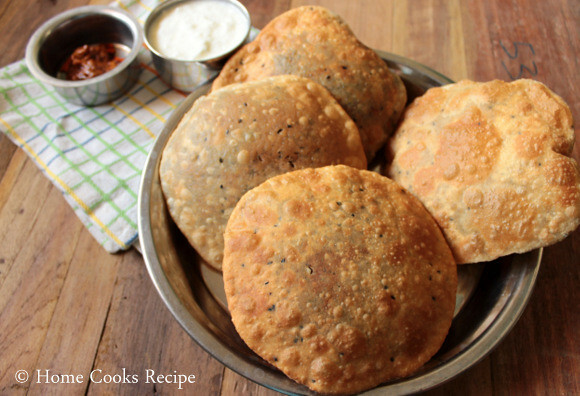 Bedmi puri is between kachori and puri, as the stuffing is made with urad dal. I eyed on this puri from tarla dalal's cookbook. 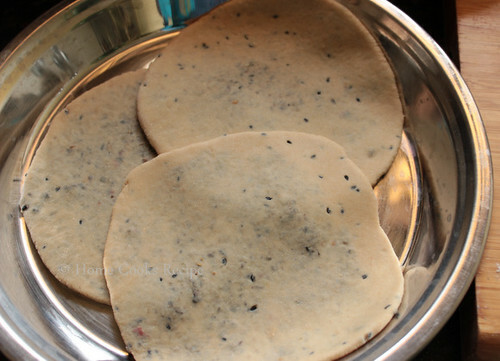 even i made it once long back, me and hubby liked these puri's a lot! 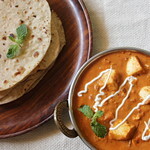 Who would say no to a healthy puri like this? when i tried out these puri's last saturday, i clicked pictures of these lovely puri's to share with you all. 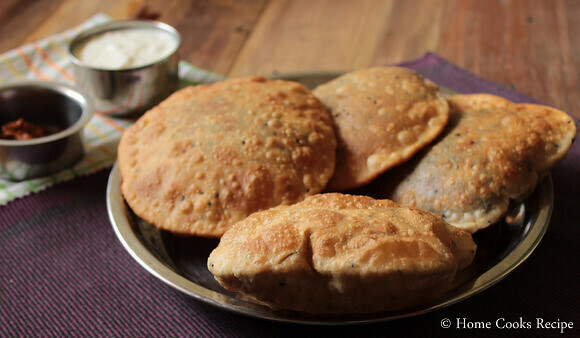 These stuffed puri is normally served with aloo sabzi. but i served with curd and pickle, like we serve stuffed paratha's. it also paired well with the puri's. 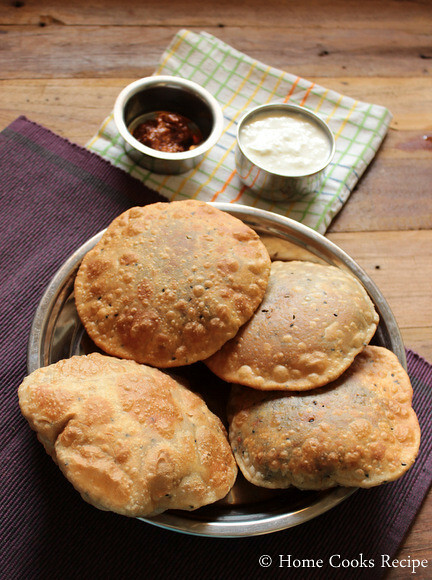 Try these stuffed puri for a week end break-fast. sure your family will like it. if you are serving for kids, reduce the dry red chilli and pepper in spice mix, so that they can also eat these healthy stuffed puri! Soak the split black gram / urad dal / udacha ulundhu with skin in water for about 4 hours. To prepare the dough, take wheat flour in a large bowl, add salt and nigella seeda and mix with the flour. keep sprinkling little water and knead them all together into a pilable dough. add 1/2 tsp oil towards the end of kneading and knead well. the dough should be little tight than we knead for chapathi/phulka. Divide the dough into 8-9 balls. keep aside. Dry roast the corriander seeds, dry red chilli, pepper, saunf and cumin. grind the roasted one's into a coarse powder. Drain the soaked dal completely without water and grind them coarsely in your mixer. sprinkle little water if needed. add salt to taste and grind the dal coarser. Heat 1 tsp oil in a pan, add the coarsely ground urad dal and the spice mix and mix well. mix them in medium flame for about a minute. the urad dal tends to stick to the pan, anyways make sure the mix is dry and well mixed with the spice mix. remove from flame and let it cool. once cooled divide the urad dal mix into small ball's that has to be stuffed. 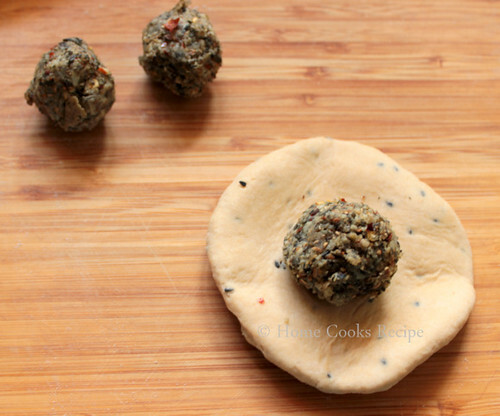 Now roll the wheat dough into a thick 3'inch diameter round and place the urad dal stuffing in centre and fold all the edges of the dough to cover the urad dal stuffing. dust it with little flour and roll them lightly into a medium shaped puri. similarly do the stuffing and roll the other puri's. Heat 1 and 1/4 cup of oil in deep pan and fry the rolled out stuffed puri's. fry till they reach golden brown in colour. fry the both sides of the puri. 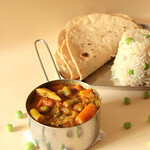 serve the puri hot with aloo sabzi or with curd and pickle. I used skinned split urad dal. as skinned dal is good, you can also use it. you can also try it in whole urad dal de-skinned. Make sure the urad dal is grinded coarsely with little water, only then the stuffing will be intact when rolling the puri. We love to have keerai at home. even my son, will eat, though i have to tell him, how good is it. that's how i was trained to eat my greens by my grand father. he used to be very informative on dining table, telling me, ponnanganni is good for your eye-sight, sirukeerai is good for your kidney, etc. 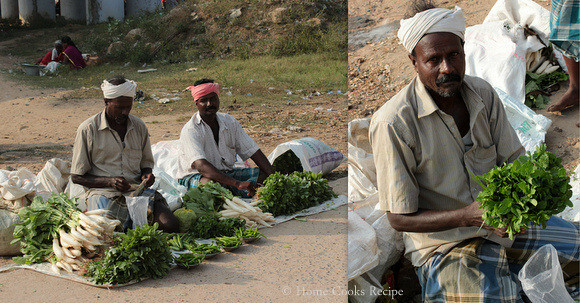 We went to kanchipuram for a day trip and on a nearby village we found farmers market, which we call as sandhai in tamil. we just stopped the car and bought few greens and vegetables, which were so fresh and cheap! its a new experience for me and my son! 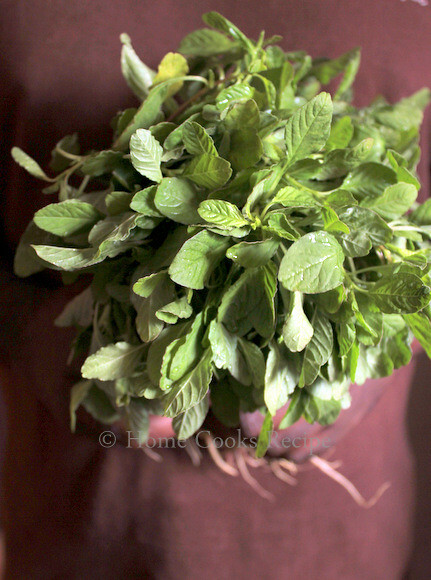 Pluck the sirukeerai from the bunch, put them in a strainer and wash the greens atleast thrice to remove the sand and dust. Wash the moong dal and cook the dal in 2 cups of water with a pinch of turmeric. it takes atleast 10-15 mins to get cooked. While the dal is getting cooked, in a small pan, heat oil, add mustard, and let it splutter, add urad dal, dry red chilli, cumin and hing. roast them for few seconds and add crushed garlic and finely chopped small onions. saute till it turns translucent. 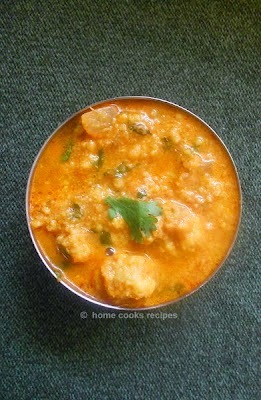 Once the dal is cooked, add the sirukeerai to the dal and cook the keerai, it takes almost 5 minutes. add little water, if needed to cook the keerai. once the keerai is cooked, add the tempering and sauted onions and garlic to the keerai and dal. Add salt to taste and mix well. now you can either use your blender and blend them all together or use your mathu and mash the greens. 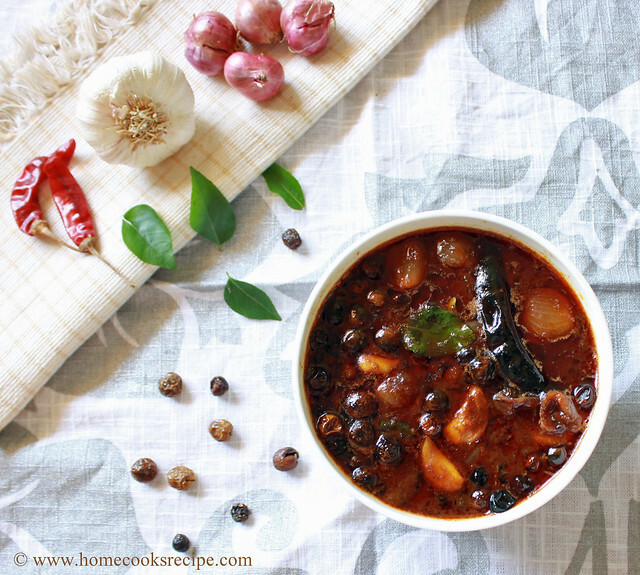 its the more traditional way and this gives the tastier keerai masiyal. Use less amount of moong dal, it makes the masiyal taste good. also cook the dal on a open pan rather in pressure cooker. Sirukeerai is good for kidney. intake of this greens considerable increases the urine output. Sirukeerai masiyal can be given for pregnant mom's. To start the New year with a sweet post, here is the gajar ki kheer. me and hubby love Gajar ka halwa the most. it is always our valentine's day dessert! 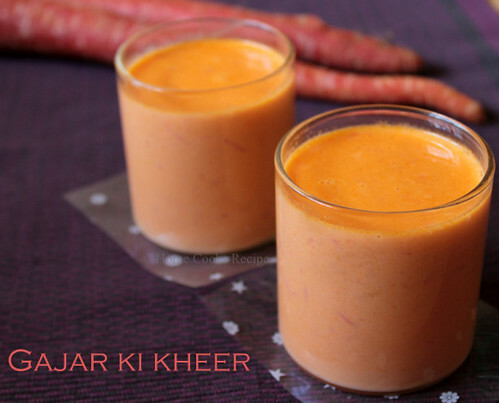 This is the first time, iam trying kheer with these delhi carrots and i should say, kheer tasted quite good. 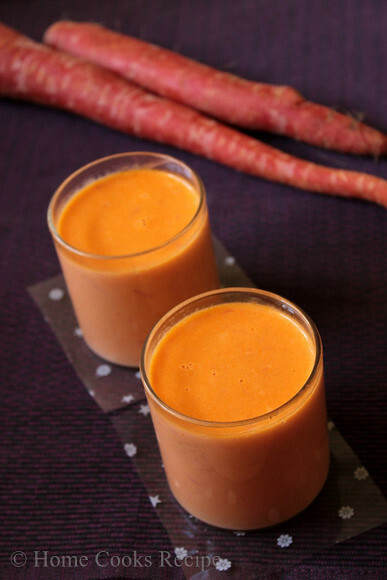 there is a real good difference in making kheer with normal orange carrots and with these delhi red carrots. do try, if you have not tried. Heat a pan, add ghee, and saute the grated carrot in the ghee for about 3-4 minutes, till they shrink and come together. Add a cup of milk or till the carrot immerses and put the flame to medium and keep stirring the carrots till they are well cooked. this may take about 5 minutes. Once the carrots turn soft and cooked, remove from flame and cool it down. on cooling grind them into a thick puree, without adding any milk or water. Now add grinded carrots to the pan, add the rest of the milk about 1 cup and sugar. mix well, till the sugar dissolves. When the kheer comes to boil, switch off the flame. if you wish garnish with nut's and raisins. I served my kheer plain and chilled. 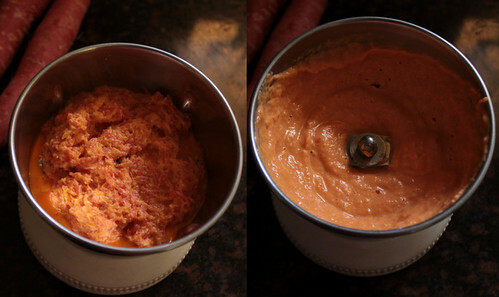 I reserved 2 spoons of carrot before grinding and mixed it finally when the kheer is done. 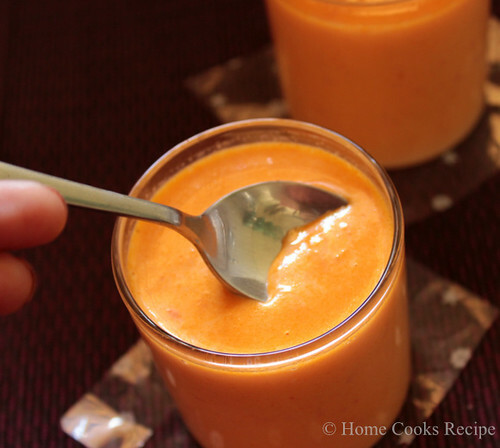 strands of carrots gave a good texture to the kheer. The kheer consistency should be thick, so add thick milk after grinding. You may add cardamom powder and nuts towards the end.